A simple method to define positive economics is that it is not suggestive in nature. Statements which describe what was, what is and what would be come under positive economics. These statements don't tell us about remedy to solve a particular problem. In other these statements don't offer any suggestions. These statements are based upon facts and figures collected so these can be verified but it does not guarantee of truth because facts collected may be wrong. Example: you may read about per capita income status of a country stating that per capita income in the year 2018-19 is 80000 per month but actually it may not be true because every person in a country cannot earn the same. This is a only statement stating about the per capita income status of a country based on facts collected. Positive statements only describes about an economic activity. ∆ In India, in 2017, wage rate was Rs 340. ∆. Sachin Tendulkar is the best batsman. ∆ Government of India will increase tax on alcohol products next year. ∆ Total amount spent on poverty alleviation programmes in the current year is Rs 5000 crore. Normative statements only describe “ What ought to be”?. These statements are suggestive in nature hence include opinion. Normative statements are merely an opinion. These are not based upon facts and figures. So these cannot be verified. 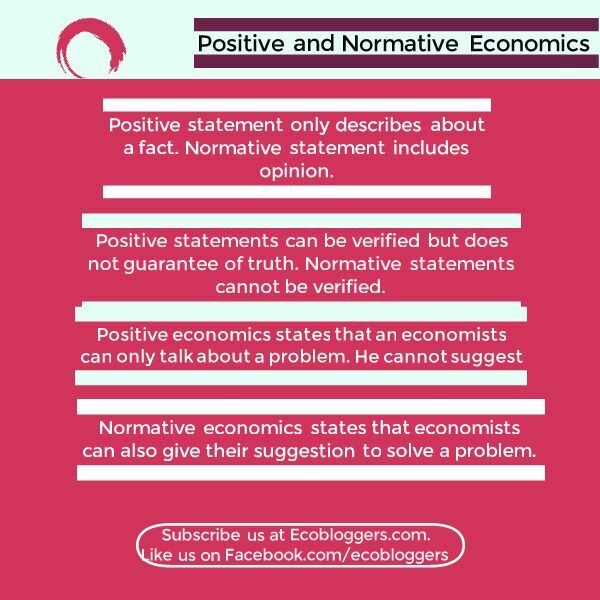 In normative economics, actually, debates take place because one or more economists may not agree with the opinion of an economist. Here I am writing two sentences so find whether statement is positive or normative. √ There is a wide-gap between rich and poor in India. √ The gap between rich and poor must be eliminated by taking effective steps by the government. First statement is a positive statement and second step is a normative statement. ∆ India should spend more in education sector for fast economic development. ∆. India should reallocate resources efficiently for reducing gap between rich and poor.